Is Walking Your Go-To Workout? I love walking, and do a lot of it, but I consider it more recreation than “serious” exercise. I need to get aerobic and/or do some weights to feel like I get exercise “credit.” Times when I just walked, I felt much less fit and started to gain weight. Maybe when I’m older though–it really is good for you and much better on the joints than running. I am with Crabby.. I really need to hit it hard for my cardio. At 51.5 now… just have to say I am on my way to 52, 🙂 , I know that at some point, as Crabby pointed out again, I may have to pull back & walking may be more the norm for me BUT for now, I can still do stuff that people half my age do so I am going with that for as long as possible! I do love walking just for the sight seeing part of it & for R&R. Saying that, though, it is a great form of exercise for many, gets them outside, they can push the kids & take them with them if they have kids, good for people with bad joints etc. SO, I do understand why others love it for their form of exercise. 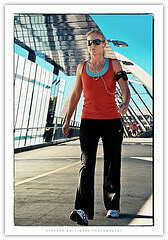 There is always power walking too for those that want to kick it up a notch & have no joint issues! this is just me personally, but i think if this is the exercise of choice for people…and long as they are hoofing it hard down the pavement, getting their heart rate up, and living healthy that is awesome. I would love to run instead of walk, but because of arthritis and a bulging disc in my low back, running just isn’t an option for me. I’ve taken to walking long distances at fast paces, but it takes a long time and a ridiculously fast pace to get a good workout! It can certainly be a supplemental workout though! I adore walking, but my doctor says that hill walking is not going to be a good thing for me right now. And where I live, nothing BUT hills! So what walking I do, I do on the flat gym floor at my health club. I can't quite see marching in place in my living room though. I'd get BORED fast! There, I do some strength workouts with FitTV and Gilad right now. And when I feel in better shape, I'll probably tackle some DVDs. Cardio I do partly in the pool, partly on my Nordic Track. My heart rate doesn't go up that easy walking… and I can't go faster or my feet/ankles/right knee take too much of a pounding. I am not really old, but have a really crappy back so running is probably not such a great idea for me anyway.